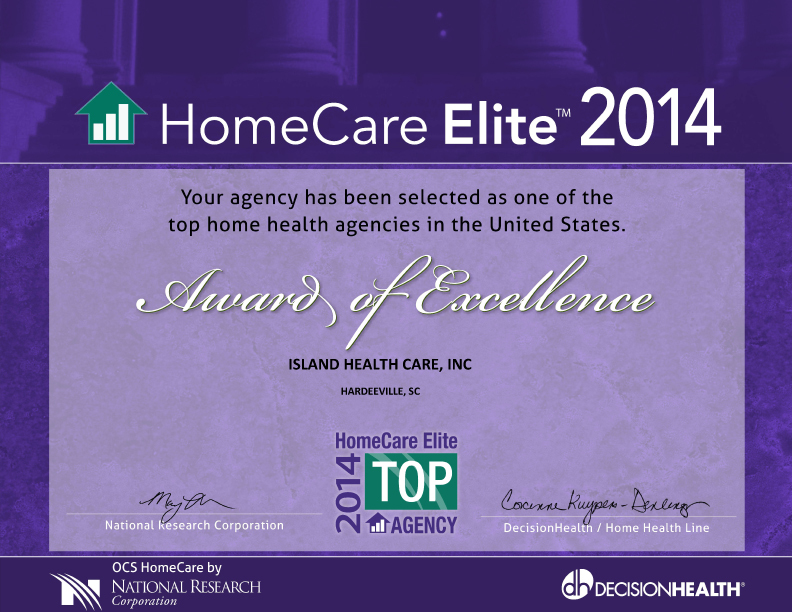 Today, THA Group Island Health Care announced that it has been named a Top Agency of the 2014 HomeCare Elite™, a recognition of the top-performing home health agencies in the United States. Now in its ninth year, the HomeCare Elite identifies the top 25 percent of Medicare-certified agencies and highlights the top 100 and top 500 agencies overall. Winners are ranked by an analysis of publicly available performance measures in quality outcomes, best practice (process measure) implementation, patient experience (Home Health CAHPS®), quality improvement and consistency, and financial performance. In order to be considered, an agency must be Medicare-certified and have data for at least one outcome in Home Health Compare. Out of 9,994 agencies considered, 2,501 are elite. THA Group President and CEO, Ellen Bolch, credits her team’s spirit of innovation, use of leading edge technology in the person-centered practice of telehealth, unparalleled clinical excellence, and dedication to patients and families with the agency’s ability to achieve recognition as one of the HomeCare Elite. “Our mission is very simple: Health Care. For Life. At Home. We believe it is an honor to serve the aged, the infirm, and the dying,” said Bolch. The entire list of 2014 HomeCare Elite agencies can be downloaded by visiting the National Research Corporation website at www.nationalresearch.com/homecareelite. For over 25 years, DecisionHealth has served as the home care industry’s leading source for analysis, guidance and tools that improve revenue cycle performance, profitability and regulatory compliance. Agencies nationwide turn to DecisionHealth for education and training, coding and billing solutions, and ongoing expert guidance through its family of subscription-based services. DecisionHealth also certifies home health agency professionals in coding and OASIS-C through its Board of Medical Specialty Coding & Compliance, and provides custom consulting services to agency leaders through its DecisionHealth Professional Services unit. For product information, call 1-855-CALL-DH1 or visit www.decisionhealth.com.